According to National Commission on Minorities, Muslims, Christians, Sikhs, Buddhists, Zoroastrians (Parsis) and Jains are notified as Minority Communities in India. 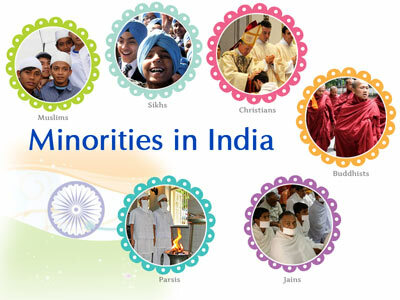 Minority Communities in India - The Government of India has taken several steps for the existence and overall development of various religious communities in India. National Commission for Minorities (NCM) was set up by the Union Government of India in 1992 to protect the existence of minorities all over India. The commission looks after the minority communities of India under National Commission for Minorities Act, 1992. According to Union Government of India, Six religious communities, viz; Muslims, Christians, Sikhs, Buddhists, Zoroastrians (Parsis) and Jains have been notified as minority communities in India. The states of Andhra Pradesh, Assam, Bihar, Chattisgarh, Delhi, Jharkhand, Karnataka, Maharashtra, Madhya Pradesh, Manipur, Rajasthan, Tamil Nadu, Uttarakhand, Uttar Pradesh and West Bengal have set up Minorities Commission to look after the issues related to Minorities in respective states. All the people falling under Minority communities in India get benefits in education and employment opportunities. Regional Minorities have set up various education schools and institutions to promote their culture and language. In Addition, they are entitled to reserve a specific quota of seats (for students and teachers) for people belonging to their own communities. There are various Government schemes which provide direct aid to educational institutions promoting regional communities in India.